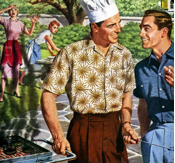 “The Good Life” was the mantra of the United States in the 1950s. The country had emerged from a devastating economic depression and a brutal world war into a era of seemingly unbound plenty. The economy was in high gear from the war: there were new products to consume for well-paid workers to consume as factories switched from military to civilian production, and suburban expansion was financed by the federal government. The Utopias promised — and not delivered — by political leaders and intellectuals in Europe, Asia and beyond throughout the 19th and into the 20th centuries seemed to be almost within the average American’s reach. Nothing symbolized “The Good Life” more than the backyard Bar-B-Que. A well kept lawn, a modern charcoal or propane fired grill, and bountiful processed food, along with family, friends and leisure all combined for an idyllic afternoon. Indeed, there is plenty wrong with the American backyard Bar-B-Que. In the post war period resources were channeled from healthcare, education and urban development to – literally — pave the way to individual home purchases in the suburbs. 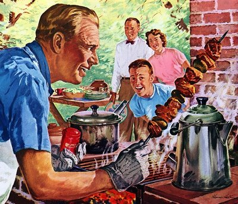 Burger smoke wafting into the air from a million backyards, each separated from the other by a picket fence, symbolize the atomization of the public, as around each grill a nuclear family, perhaps joined by a few close friends, acted out the bourgeois fantasy of self-sufficiency. And the Bar-B-Que does not stand alone, it is but one component in a an array of leisure activities that gobble up resources and pollute the planet; each hamburger flipped and chicken thigh basted makes an implicit argument in favor of an ecologically unsustainable lifestyle. Then there is sartorial travesty of leisure wear: grown men and women wearing clothes best suited for children at the playground: t-shirts, sneakers, and shorts, or worse: track suits whose elastic waistband expands effortlessly to accommodate the ever-growing American girth. But there is also a positive utopian dream at the heart of this crass, materialist travesty. The very form of the grills themselves bear witness to this dream: the domed flying saucers which transport the suburban backyard into a fantasy of the future; the sleek brushed steel grill which bespeaks the modernist ideal of integrity of material more eloquently than Bauhaus or the Seagram’s building; or the tropical island motif common in the larger consoles that, like the later paintings of Paul Gauguin, conjure up nothing less than an ideal of human harmony with the natural world—a backyard Rousseauian idyllic. In each case the Bar-B-Que takes you away, some place other than where you are. It transports us to the Greek roots of the word Utopia: a magical “no-place” where race and class and gender divisions disappear, concrete dissolves into a plush lawn, and work is a hazy Monday away. The Bar-B-Que is remarkably egalitarian and multicultural, a leisure locked dream of universalism sequestered within the class, race and gender segregated reality of the United States. While it is easy to stereotype the BBQ as a white, middle-class, suburban activity, Chicano families gather around the grill at Griffith Park in Los Angeles, Nuyoricans stoke charcoal in Bronx casitas, and African-Americans roast chicken in the backyards of the Mississippi Delta. The very word barbecue derives from the word “barabicu” (meaning sacred fire pit) found in the language of the Taíno people of the Caribbean. The Bar-B-Que promises the dream of class egalitarianism. Meat smoke rises from the slums of Detroit to the gated communities of Orange County. No politician in the United States dares run for elected office without a photo-op at a grill. Indeed, when the king and queen of England came to visit the country on the eve of World War II, President Franklin D. Roosevelt invited them to his palatial estate where they were treated to an American-style Bar-B-Que replete with grilled hotdogs. In a society like our own, dividing ever more rapidly into the haves and have-nots, the appeal of the Bar-B-Que may be one of the last places where the revolutionary American ideals of a democratic, classless society are actualized. But the phantasmagoric kernel of the Bar-B-Que is a dream of endless leisure. This revolutionary possibility of a world without work has been recognized – albeit in its non-Bar-B-Que form – by radical theorists like Karl Marx’s son in law, Paul Lafargue, who penned The Right to be Lazy to contemporary Italian Marxists who theorize that any revolutionary movement needs to recognize that radical subjectivity has migrated from the work place to sites of leisure. Where other utopias have been ordered around the fantasy of or a unified people (Fascist) or non-alienated labor (Marxist), the Bar-B-Que utopia is one where work and social regimentation are left behind. This is a space in which one can dress as one pleases, be as one is, and, if one desires, take a nap on a hammock with beer in hand. In their 1972 manifesto, Learning from Las Vegas, the architects Robert Venturi, Denise Scott Brown and Steven Izenour attempted to reform and reconceptualize the relationship between designers and the people they design for. As “Experts with Ideals,” they argued, architects traditionally “build for Man rather than for people.” Venturi and his colleagues wanted to challenge this practice by building for real people rather than abstract “Man.” It was in Las Vegas, garish and commercial it was, that they glimpsed a model for the future. Las Vegas was, is, not a city planned and built by idealistic experts, it is a phantasmagoria constructed to appeal to everyday people’s desires. The contours of the modern Bar-B-Que have, no doubt, been shaped by experts with ideals, be they grill manufacturers or government housing bureaucrat. Yet the Bar-B-Que also needs to be recognized as an organic vision of Utopia lovingly imagined and created by the people. The dreams of the ideal Bar-B-Que – seemingly alone among modern Utopias – have never lead to the gulag or the death camp. There has not been, nor do we believe there ever will be, a totalitarian state of Bar-B-Que. 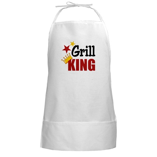 Abstract Man may want to collectivize farms or subject their will to the Fuhrer, but everyday people want to grill.